Here is a table of data. Each row shows two measurements of a triangle. Here is the table of isosceles right triangle measurements from the warm-up and an empty table. How can you organize the measurements from the first table so that any patterns are easier to see? Write the organized measurements in the empty table. For each of the following lengths, estimate the perimeter of an isosceles right triangle whose short sides have that length. Explain your reasoning for each triangle. In addition to the graphic representations of data you have learned, there are others that make sense in other situations. Examine the maps showing the results of the elections for United States president for 2012 and 2016. In red are the states where a majority of electorate votes were cast for the Republican nominee. In blue are the states where a majority of the electorate votes were cast for the Democrat nominee. What information can you see in these maps that would be more difficult to see in a bar graph showing the number of electorate votes for the 2 main candidates? Why are these representations appropriate for the data that is shown? 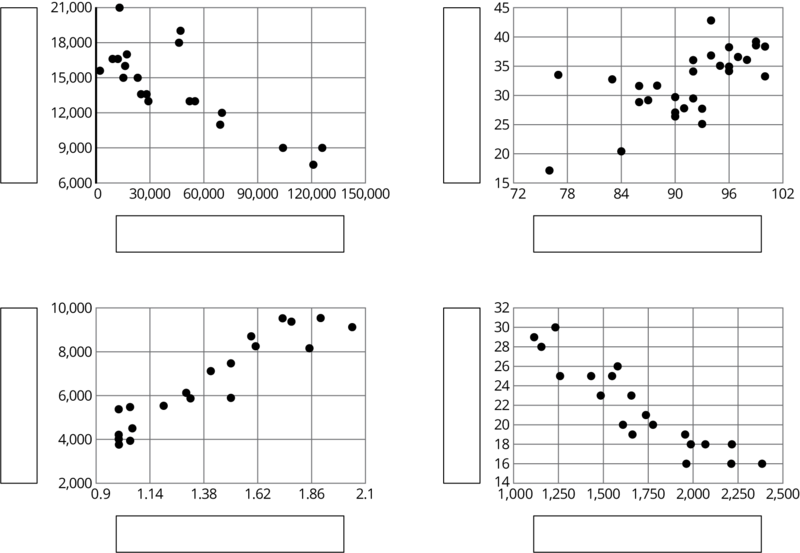 Here are four scatter plots. Your teacher will give you four tables of data. Match each table with one of the scatter plots. Use information from the tables to label the axes for each scatter plot. Consider the data collected from pulling back a toy car and then letting it go forward. In the first table, the data may not seem to have an obvious pattern. The second table has the same data and shows that both values are increasing together. 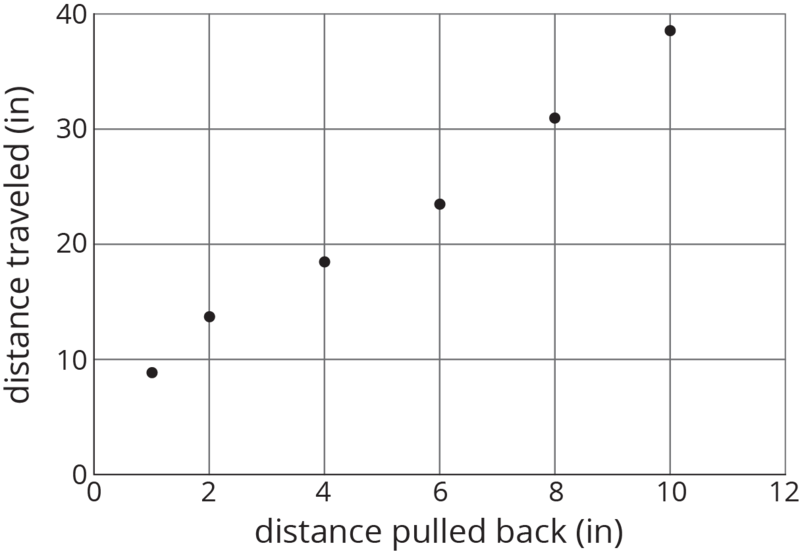 A scatter plot of the data makes the pattern clear enough that we can estimate how far the car will travel when it is pulled back 5 inches. Patterns in data can sometimes become more obvious when reorganized in a table or when represented in scatter plots or other diagrams. If a pattern is observed, it can sometimes be used to make predictions. A scatter plot shows data points for the relationship between two variables on a pair of coordinate axes, one for each variable.